This tiny perfect cottage has 3 cozy bedrooms and "lives large" with vaulted barnboard-beamed ceilings throughout and a surprisingly big open living/dining area with entire wall of glass to the river and expansive deck. Mandatory utilities (gas, hydro, water / sewer, unlimited wifi) are NOT included. Optional snow removal is NOT included. Grass cutting IS included. LESS THAN 30 NIGHT STAYS ARE ILLEGAL (per TBM Short Term Accommodation Bylaw 2013-50) so please, don't even bother asking. Sorry. UNIQUE location is close to 'everything'! Hello! I live in Toronto with my husband, Tom and our dog, Teddy. We both play in community orchestras, chamber groups, pit bands for musicals etc. so can't use the cottage all the time ourselves. It's too perfect to sit empty - we make it available for others to enjoy. Over 20 yr ago, we bought a log house just outside Thornbury because it's a year round recreational area. Thornbury is smaller, and more charming, than Collingwood with quaint shops, great restaurants, art galleries, a fish ladder and mill pond, harbour. We knew we'd always want a place here, but in town so we could park the car and walk to everything. In 2008 we bought this 1940's vintage fishermans hut that had been added onto by handymen over the years. We added a 2nd bathroom and renovated back then, but eventually demolished all but the roof and totally rebuilt it in 2017. Being in town and "walk to everything", yet with 0 traffic and right on the water with a river / bay / harbour view is unique! The sailing and fishing activity adds a bit of extra 'life' and facing west affords front row seats to some spectacular sunsets. We find the layout 'works' perfectly, with the master suite secluded on the kitchen side, separated from the other 2 bedrooms and bath by the living/dining room. The 'master' can access the kitchen, driveway and deck without disturbing the rest of the household. While the cottage itself is all brand new in Dec 2017, the experience is still 'vintage’ simple pleasures. Depending on the season: the warmth of the fire, walking up the river bank to watch the salmon jumping up the fish ladder, the smell of fresh bread or cinnamon buns at Thornbury bakery, the crunch of an apple picked from a tree in the front yard, relaxing bike ride from your back door along the Georgian Trail to Collingwood or Meaford , jumping off the harbour pier with the kids in summer, a stroll to the Mill, Bruce, Fabbrica (new Mark McEwan restaurant) or the Mill or Dam Pub for dinner, the colourful sunset through the sailboat rigging, the calm of patient, silent fishermen. 'As is' old bicycle in shed but you can rent from Squire John's in Craigleith. Great location in a wonderful town. We stayed in this cottage for July and August 2018 and had a wonderful holiday. 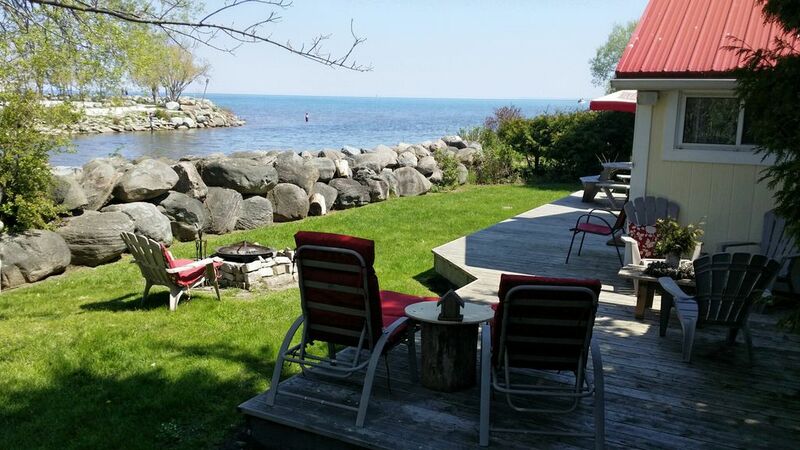 Located right on the Beaver River, near Georgian Bay and 10 minute walk to Thornbury city center, this tiny cottage was perfect for us and our pet dog to relax and enjoy the summertime. Close to swimming area, can fish from the property. Owners (D+T) were very responsive to any requests we made and the lawn was maintained by a lawn care company so no maintenance required by us. We will look at staying there again!! Thx. It is everything everyone has written about here in VRBO reviews and now so much more with the renovations. “Fantastic experience and Stay”. Dorothy and Tom have been wonderful! My husband and I had a terrific week exploring Thornbury and the surrounding area. Your cottage was a very comfortable and cozy retreat, and many hours were spent enjoying the backyard view of the bay! Your attention to detail inside the cottage left us not wanting a thing. The location was ideal as we were close enough to walk or bicycle downtown or to the marina and yet it was private enough to enjoy that camping feeling sitting around a backyard campfire. Thanks again for a wonderful vacation. It's difficult to describe the joy one feels when making that last turn after a 5 hour drive, finding in front of you, the Cottage you booked from a Continent away, exactly as in the pictures in the listing. Indeed, within 10 minutes, we were at home. Inside and outside, everything was just super and indeed I've pinned the listing to my desktop so that I can click on it every time I feel nostalgic about our sublime 2 weeks there. This property was spotless and everything including the appliances all functioned perfectly. Bedlinens were all there too. The location was actually even a little better than promised and sitting on the extensive deck in the evening, literally on the edge of Georgian Bay, really does take some beating. The attractions of Thornbury are so close by that if you didn't need it for touring, you could dispense with a car. The Owner was a mine of information and we followed up on most of her recommendations. Here too we weren't disappointed and particularly enjoyed the Dam Pub and Bridges in Thornbury. Also Ted's Diner on Range Road near Meaford is a real gem and the Canadian Cheeseplate at the Coffin Ridge Vineyard (not to mention the wine) is simply outstanding. We also took a 30,000 Island Cruise from Penetanguishene, booked from the UK and that was very worthwhile too. Friends from about 50 kms away came to visit and were so impressed with our "find", they will be recommending it to their Family and friends from all over Canada. To summarise, for Europeans especially but also for people more local, if you want to see a part of real Canada and live like Canadians do, try this. Charming cottage in equally charming town! We thoroughly enjoyed out week long stay in this well appointed, clean cottage overlooking Georgian Bay - laundry facilities, great shower, games, DVD player, wood stove and fire pit and more. The massive deck allows you to chase the sun or the shade throughout the day, while waves lapping on the shore make gentle noise in the background. Perfect for watching the fishermen right across the riverside in the early morning and evening and beautiful sunsets. Kayak launch at the public park a very short drive away. Thornbury is a charming town with some great restaurants - if you don't want to use the cottage BBQ, check out Bruce Wine bar and Simplicity Bistro among others. A terrific week of unwinding! We found the cottage very pleasant and really well situated close to Thornbury.Hope to be back ! We Found the entire week excellent . We loved the proximity to Thornbury.Very clean and well looked after.See you next year! Yes, everyone likes the convenience of being 'in town'. Thanks, ladies! The Blue Mountain resort area of South/Central Ontario boasts a wide variety of outdoor activities year-round (ski, sail, hike, bike are the most popular). Thornbury retains its original rural 'small town' vibe while catering to Toronto 'big city' standards. Some favourite activiteis of note: : bike the 35 km Georgian Trail, Scandanavie Spa, whatever free event is on at Village at Blue resort, Scenic Caves for cross country skiing in winter or zipline/nature walk other times - or just the spectacular views from the lookout off the road nearby, Coffin Ridge winery on the way to Owen Sound (eat on the deck- get the cheese tray); in Thornbury: all restaurants (Fabbrica, Bruce, the Mill, Dam Pub), Cheese Gallery, Ashanti coffee shop, Thornbury Bakery, skiing at the Peaks (private club) or Blue Mountain (public), swimming off Thornbury pier or with kids at Little River Park beach, summer Sunday nights Jazz in the Bayview Park, watching the salmon climb the fish ladder in fall, picking raspberries in summer, Gramma Lambe's and Gold's roadside fresh local produce, making applesauce or pies from our trees in fall, browsing Clarksburg / "arts-burg" , hiking the Bruce Trail... probably forgot some in there :) AND in Collingwood 20 min. west is a waterfront boardwalk, excellent / varied bike trail, Sunset Park beach and award-winning playground, Elephant Thoughts for kids, Too Good to be Through and Design by Consign shops, Tremaine restaurant with artists in residence above, the Shipyards waterfront.. maybe that's enough, huh? ** Rates do NOT include Mandatory Utilities (gas, water/sewer, hydro) nor Optional Services (wifi, satellite TV, snow removal). Grass cutting IS included in rates. ** ** MINIMUM SKI SEASON STAY is 4 MONTHS , not 90 days ** (unfortunately this VRBO/Homeaway website does not allow Owners to specify that a minimum stay longer than 90 days) UTILITIES: We will specify a utilities deposit you will pay upfront. After the actual utility bills are received we will provide them and 'settle up' with you (either refund any overpayment or request additional payment).